As Parodius was a parody of Gradius, Star Parodier is a parody of Super Star Soldier. Choosing from either Bomber Man, a cute PC Engine or the Paro Caesar spacecraft, you blast your way through various themed levels and face a wide variety of interesting, amusing and sometimes familiar enemies. A NOTE ON THE TITLE: In Japanese, Super Star Soldier is spelt more phonetically, i.e. Supaa Sutaa Soruja. So as a parody, Paroja is a contraction of Soruja (Soldier) and Parodi (parody). 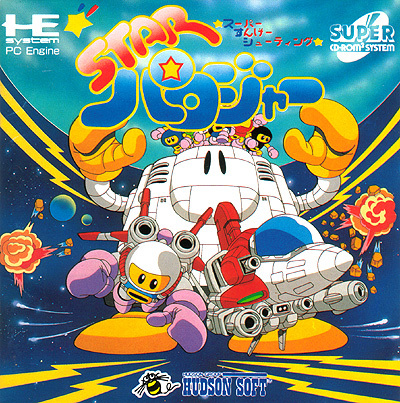 The title is written as Star Parodier - an accurate representation of the intention, and as this seems to be the common spelling among PC Engine fans. All this confusion and word-play is probably why many import companies just settled on the less complicated Star Parody. Was due for release in the USA as Fantasy Star Soldier. Star Parodier is Hudson's excellent take on Konami's Parodius, with the titles being parodied being the Soldier series instead of Gradius. 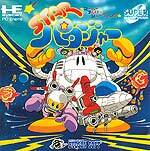 Personally, I think Parodius does a better job of being whacky and amusing, but Star Parodier is a damn good game. You can select three "ships", including the original ship from the soldier series, a PC engine, and a massive robotic Bomberman. Each has three different possible main weapons, and a variety of extra weapons. I've heard that not all loadouts are created equal, which is a shame, as there's often a nice puzzle element in choosing the right weapon for the right scenario/boss, and making one or two loadouts superior in any situation limits that kind of thoughtful play. Graphics are stunning, as expected from a Hudson flagship game, and the bosses, stages and enemies are all inventive and jolly. Some good sampled speech in there too. Perhaps something of a lesser known title in the west.